When: Through April 21, 7:30 p.m. 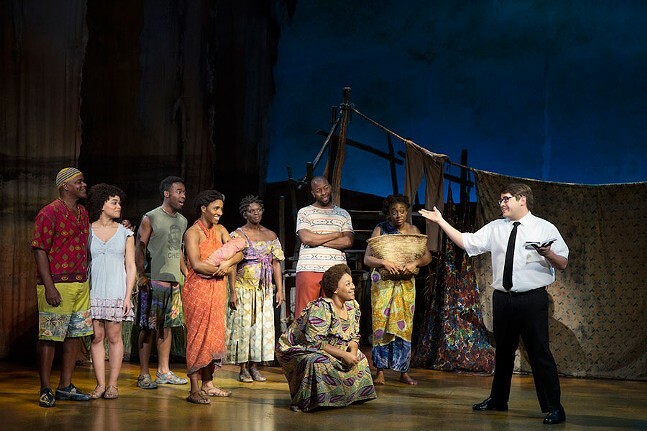 In many ways, The Book Of Mormon adheres nicely to Broadway tradition. The lead characters are a mismatched duo of Mormons on a mission in Uganda: one schlubby, inept, and loveable, the other straight-laced, ego-driven, and handsome. The initial friction gives way to real friendship and growth, supplemented by no shortage of excessive mugging, outsized dance numbers, and sugary melodies. But nobody talks about that, and why would they? The musical was penned by South Park creators Trey Parker and Matt Stone with Avenue Q's Robert Lopez — and it shows. Both the incisive, shocking humor, and the loving but snarky homages to Broadway history of the creators' past works are alive and executed beautifully here, more than earning its absurd number of accolades (nine Tony Awards, international tours, star-making in the form of its original leads Josh Gad and Andrew Rannells). And now it's back by popular demand at Heinz Hall. Don't miss out.